Teresa Bateman was born in Moscow, Idaho, but moved to Washington when she was three, and that's my home state where I still life. She has a Masters in Library and Information Science from the University of Washington. Turkeys around Squawk Valley just don't jump into pots anymore—they are way too smart for that. So, the townspeople hatch a clever plan. They host a turkey-themed arts and crafts fair and lure a vain bird into town by advertising for an artist's model. 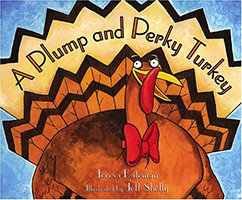 Peter the Turkey, proud of his well-stuffed form, takes the bait but doesn't fall for the trap.